Hubbell and Katie, Not Quite the Same: Nostalgia on Oprah today, with a reunion of Barbra Streisand and Robert Redford, centered on The Way We Were. (Their first interview together, hard to believe.) Though it was disconcerting to see the two aging superstars amid scenes from the 1973 movie, it was nevertheless a special moment when Redford came out of the wings after Streisand sang the title song. Redford, the Brad Pitt of his day, looks none the better for wear, and a zaftig Streisand was beret-clad and (bravely) make-up free. Both obviously share leftover warmth from the time they worked together. 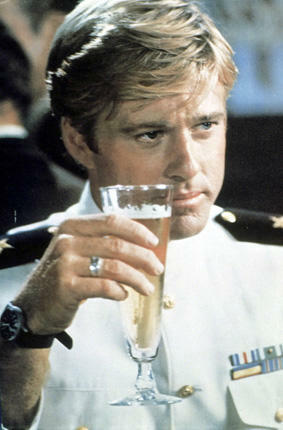 The best part for me is being able to post the pic of Redford as Hubbell Gardner in the white Navy uniform, still heavenly handsomeness in the book of movie memories. Here We Go Again: It’s kind of creepy that the Prince gave Kate his mother’s engagement ring. Talk about baggage. One can only hope she fares better than her predecessor. And who can even contemplate the media overload on this story as the wedding nears next summer?